Marketers, designers, developers, writers, photographers, etc. 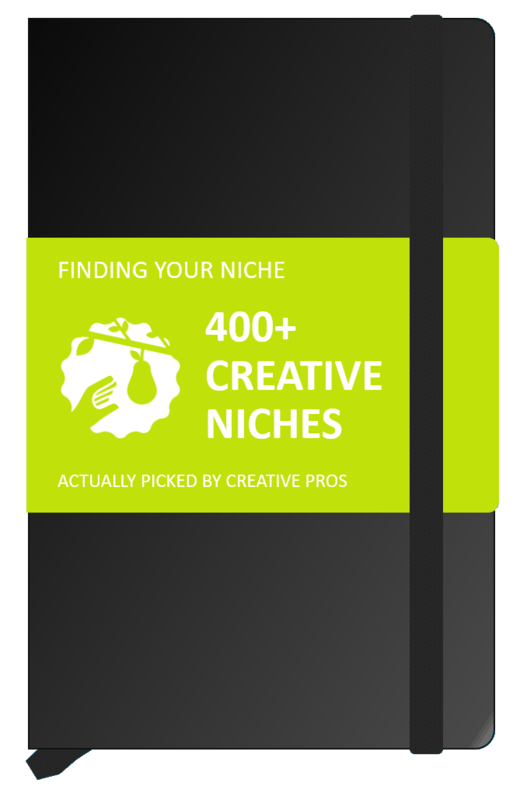 Download 400+ Creative Niches Now! FREE. Extra info. PDF + Excel. A common way to specialize is to target a specific industry. I've researched high-potential client industries for freelance web & graphic designers who focus on digital marketing. These creatives deliver things such as display advertising, landing pages, campaign sites, social media profiles, and promotional emails. I want to share my findings with you. Who buys the growing & high-paying what? You want to be in a growing niche. It has space for new players. If you are into marketing and advertising, you definitely want to be on the digital side of things. 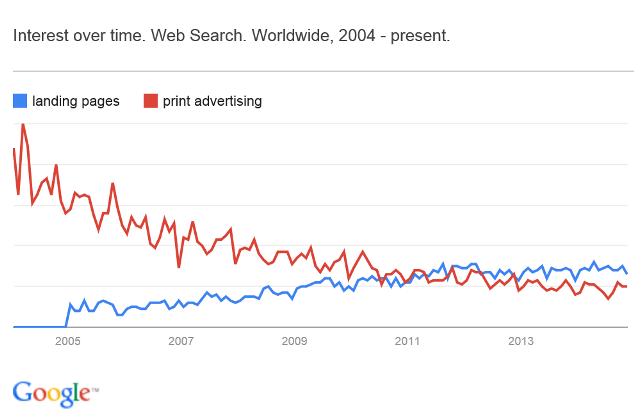 It's no secret print advertising has been in decline for a long time. 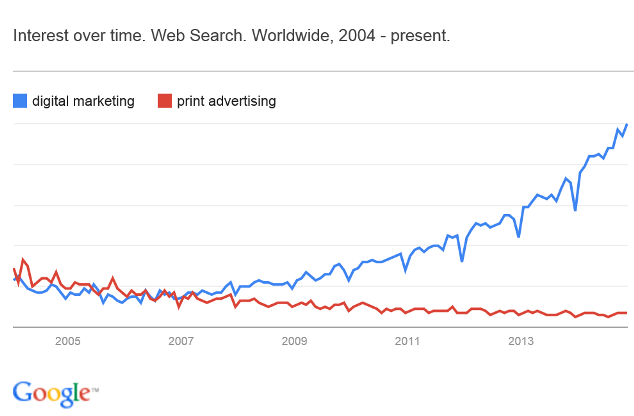 Print is still around, but digital marketing grows stronger every year. You want to offer services that pay well. There is definitely a growing interest in digital marketing, but are creatives making money in the niche? A clear sign of what pays is how much your competitors are investing in advertising for it. Look at the table below! 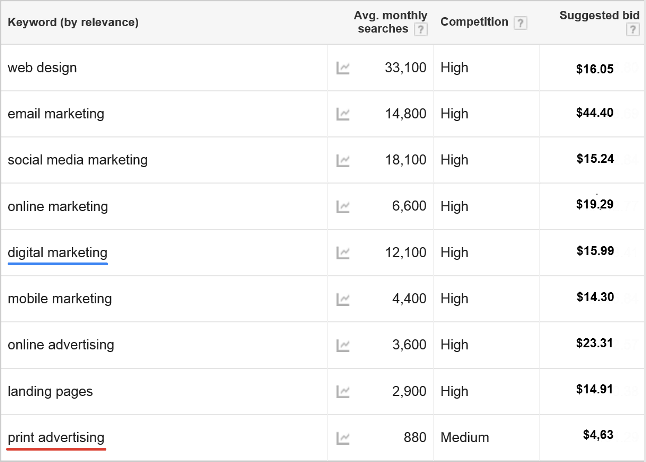 The bids on “digital marketing” and other related keywords are 3 to 10 times higher than for “print advertising.” The suggested bids clearly tell you where the money is. High bids mean the competition is stiff in the niche, but they also mean people are making money. 3. Who Buys the What? Now we know that the digital marketing niche both grows and pays off. 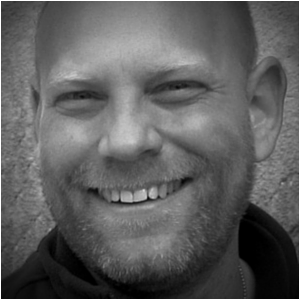 But which client industries are the best to target for your digital marketing offer? I used “Google Instant” to find client industries showing interest in digital marketing. Google Instant is the function that automatically suggests keywords as you type in the search box. Basically Google Instant shows you what people search for the most. I searched for “digital marketing for…”, and then watched the industries suggested. The above searches gave me 262 industries interested in digital marketing. Too many, everything from “law firms” to “plumbers” came up. Which of these client industries had the highest potential? To qualify for high potential Google Instant had to suggest the client industry for many forms of digital marketing. For example, “real estate” was suggested for all eight digital marketing disciplines, while “plumbers” only was suggested for one. The advertiser competition had to be stiff (remember, stiff competition means people are making money in the niche,) and the niche had to have healthy monthly search volumes. The table lists 16 client industries with very high (H+) to mid-level potential (M.) The order of potential is obviously a bit approximate. There are always a few rotten apples in every niche, so please see the “red flags” in the comments. I've weeded out 245 industries with low or very low potential. H+ RESTAURANTS Restaurants Red Flag: Avoid mom & pops since they are considered high-maintenance clients. H+ LEGAL SERVICES Lawyers, law firms Profitable small business sector. H EVENTS Events Tree main sectors: 1) Sports events 2) Meetings, conference, expos for business 3) Cultural, arts, and music events. Red Flag: Small theaters often have very limited budgets. H MUSICAL ARTISTS Bands, musicians, music artists Red Flag: Artists are often considered high-maintenance clients. M DENTAL SERVICES Dentists Offices of dentists is a profitable small business sector. M FINANCIAL SERVICES Banks, financial services, financial advisors. M RETAILERS Retail, retailers Red Flag: Avoid mom & pops since they are considered high-maintenance clients. M ACCOUNTANTS Accountants Accounting, tax preparation, bookkeeping, and payroll services is a profitable small business sector. M MEDICAL SERVICES Doctors, healthcare, hospitals Service-based businesses in health care are profitable. Offices of physicians, other health practitioners, and outpatient care centers is a profitable small business sector. Unsure if specializing is right for you? Read To Specialize or Not to Specialize as a Designer?